Davenport, Iowa - So many races and not enough time to go to them all. So is the saga of the Summer Nationals. What Summer Nationals do you say? I say the UMP Summer Nationals or better said today the DIRTcar Summer Nationals. All around the land when you’re talking dirt late models and say Summer Nationals it can only mean one thing. It’s summer and it’s National. Again better said the whole racing world knows it’s time for the most demanding, hardest, costliest, tiring, and hottest dirt late model racing all year. The Summer Nationals for me are refreshing. I like hot, dirt, dust and racing. There is nothing better. Going on the road for a few days and seeing the different shades of dust from the tracks on my car with gooey bugs caked on the grill, means I’m racing. I live for this stuff and my only regret is that I can’t go to them all. I’d like to be real greedy and take the time but things like a job, wife, home responsibility and an exploding credit card from all the gas somewhat limits my inglorious obsession to go racing. If you see one, you’ve seen them all, right? Wrong! If you’ve seen one, you what to see them all! I’m lucky in one sense, the best Summer Nationals are in Illinois and I live right next to it. A two to three hour drive and I’m just about anywhere. A little more than that and I’m everywhere. If Illinois is the Land of Lincoln then just maybe the Summer Nationals in Illinois should be called the Land of Memmer. 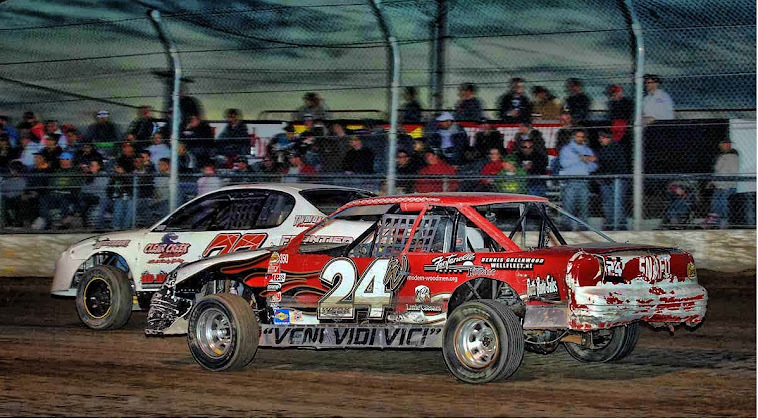 UMP was born and raised in Illinois and DIRTcar is strong there. The best races, best tracks and best racers that make the Summer Nationals are in Illinois. In all practical terms the series should just be in Illinois with an occasional trip to bordering states for cheap gas. To me this would make more sense. Starting and stopping in the Land of Memmer might even make the series remotely affordable to racer and fan. The Summer Nationals started in 1988 and this was the time I was starting to venture away from home and going to some of these races was exciting for me in the years to follow. The series transformed me from being a weekly racing fan to a regional racing fan. Seeing drivers at tracks I could only read about in the racing papers hooked me to see more and more, year after year. Stars shine during the weeks on the road while making the midnight drives to the next track but the brightest stars win championships. The names on the back of the shirt say it all; Parker, Standridge, Bloomquist, Pierce, Moyer, Aukland, Weaver, O’Neal, Babb, Erb, Feger, and Shirley. The mere fact that Scott Bloomquist, Shannon Babb and Dennis Erb Jr. have all won 3 titles and Billy Moyer's 6 titles validate the importance of the series in the eyes of history. Speaking of history and since I think it’s important, I’d like to briefly talk about time. Of course time matters. It’s the Summer Nationals and it has to be in the summer preferably June and July and last for a number of days. If the Summer Nationals is the most demanding, hardest, costliest, tiring, and hottest dirt late model racing all year then time matters. In my opinion it was at its best when it was consecutive night after night after night. Throw in the occasional Monday travel day plus rain out and there was plenty of breaks. If it didn’t rain then that’s why it’s called the Summer Nationals. The current 6 week version with holidays just doesn’t do it for me. Then when it also rains out, there just seems to be long inactivity between races. A shorter 30 day schedule with events closer night after night makes sense to me. Oh did I say it should be mostly in Illinois and adjourning states for cheap gas. Here is one last little thing that’s driving me nuts. Now I’m not the best example of a Christian but I am one. I try very hard to go to church as much as I can unless it interferes with late Saturday night races. This H. E. Double Hockey Sticks Tour thing just kind of bothers me. I don’t necessarily like wearing a t-shirt that advertises the place I’m trying very hard not to go to someday even though I still might. Leave the market catch phrase with the Summer Nationals. That speaks for itself. OK that’s enough cent$ for this month. Summer is winding down and the Summer Nationals are over for another year. Congratulations to Brandon Sheppard as our newest champion. I’ll leave you with my short version of “Stay” by Jackson Browne.